chocolate ice cream recipes | chocolate dessert ice cream recipes. One dessert that is loved and enjoyed by both kids and adults is ice-cream. Especially when it comes to kids , it is chocolate ice-cream! A scoop of ice-cream served in a cup or a scoop topped on a waffle cone or a loaded Sundae is sure to steal your heart with its enticing mouth-feel. Ice-creams are made by boiling milk, adding a thickening agent, flavoring as per your preference, in case of the chocolate ice-cream , you can either use cocoa powder or melted chocolate. They are then refrigerated in a deep-freezer followed by a process of churning and freezing till it sets completely. Most ice-cream recipes calls for not more than 5 ingredients. It is basically combination of fresh cream and milk thickened with corn flour, sugar and a flavoring agent. My favorite chocolate ice-cream recipe is the one made using a combination of drinking chocolate and cocoa powder. Chocolate Ice- Cream made using grated dark chocolate is another rich delight. 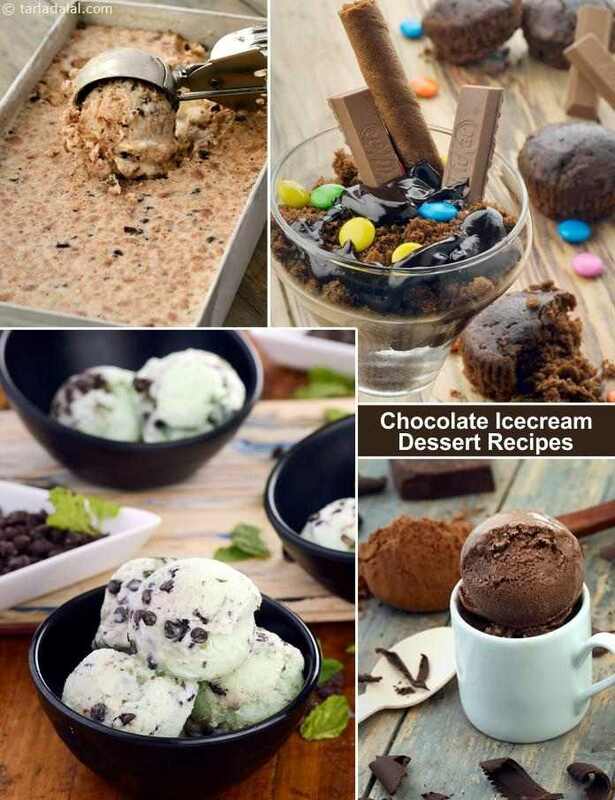 You can make Ice-Cream sundaes at home by adding an array of ingredients like gems, brownie, chocolate wafer roll, kit-kat, flavored sauce and etc etc. Here is a fun recipe of Chocolate Ice Cream Sundae that you can recreate at home easily and amaze your guests. An addition of chocolate chips gives a nice bite to the ice-cream. While most people enjoy the chocolate chip cookie ice – cream my personal favorite is the combination of refreshing mint with chocolate chips to make Chocolate Mint Ice Cream. Rocky Road Ice Cream and Chocolate Truffle Ice Cream are other delightful ice-cream recipes that you must try making at home. Hope you enjoy our collection of 9 Chocolate Dessert Ice Cream recipes with luscious mouth-feel and creamy texture. Do try them at your home and share with us your feedback.